broken wheat indian recipes. dalia recipe collection. 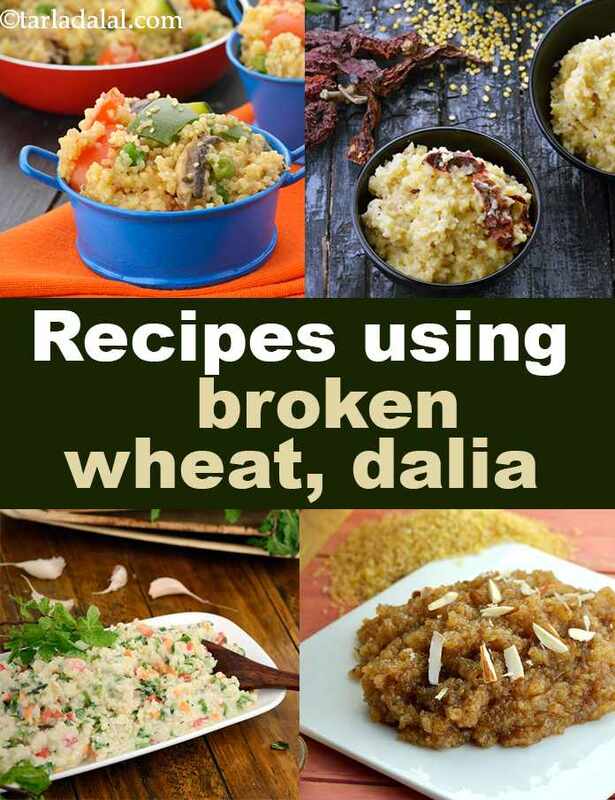 Broken wheat, also known as Cracked wheat, Dalia, Bulgar, Burghul, Fada, Lapsi, Bulgar Wheat, and Couscous is made by crushing whole wheat grains. Cracked wheat has all the benefits of wheat flour. Since, it contains the outer bran and germ of the wheat grain, it provides some additional health benefits like it is high in fiber, low in calories and an excellent food for people who want to lose weight.When broken wheat is cooked, it has a hearty aroma and a delightful nutty taste with grainy texture. Cook up an ideal breakfast with broken wheat combined with vegetables/fruits. This Broken wheat upma with a crunch of vegetables provides loads of nutrients, also this Broken Wheat, Oats and Apple Porridge is a winning combination of two power-packed cereals. Rich in fibre, this Bulgur wheat pancakes eases digestion and are an indefectible food during pregnancy. You can substitute rice from your daily meal with dalia which has no cholesterol and offers nutrients without adding any extra kilos. Khichdi, the humble one pot meal just got upgraded to another level, this Fada ni Khichdi is wholesome and tastes delectable with masala curd. You can even try cooking this delicious bulgur wheat and paneer pulao. Wheat products like rava, maida and pasta lose many of their nutrients as a result of processing and refining whereas bulgur wheat is highly nutritious and can be made into a healthy salad meal pairing with different vegetables and dressings. Mellow Mediterranean flavored Broken Wheat Salad with Chick Peas and Roasted Pepper is an extremely colorful and delicious option. South Indians for breakfast have a popular snack called Adai which we have substituted rice with broken wheat to make it healthy and diabetic friendly. If you want to know more about the Uses of Dalia, then you can check out our article on that. Enjoy our collection of broken wheat recipes below. Broken wheat vegetable delight, the easiest and no frill recipe to make when you are home tired and don’t want to cook an elaborate meal. The veggies along with broken wheat make up for all that would be required in one meal. I like to eat it along with curds. A sneaky way to get your children to eat more greens and fibre is to give them nutritious idlis pepped up with vegetables.